I’ve been hearing a lot about restoration lately in Christian circles, and I’m all for it. Frankly, I think it’s about time. For too long, we have been throwing the sons and daughters of God away. We have been allowing judgment to triumph over mercy, rather than allowing mercy to triumph over judgment. We talk about restoring marriages–but only those marriages that are broken. We talk about restoring finances–but only when people’s finances have been decimated. We talk about restoring leaders–like a prophet whose wife left him in the midst of a revival, or a televangelist who got divorced–but only when those leaders fail. In thinking about restoration as something needed only by those who stumble, we miss out on the full picture. The full picture is that restoration is God’s heart, and God’s plan, for all of us. We are all targets of God’s restoration. We are all in the middle of His restoring work in our lives. In order to have “restoration,” there must be a standard that a person is being restored unto. In God’s mind, that standard is not limited to a happy marriage, a positive net worth, or a specific job. God’s standard for restoration is much higher. God’s goal is to restore every person to His original intent for their life. That’s why we are all targets of God’s restoration. We are all in the process of restoration because God is restoring us all to His original intent for mankind. See, God’s original intent was not for you to just be saved. God’s original intent was for you to live in His glory. Romans 3:23 tells us that all have sinned and fallen short of the GLORY of God. God made you to be full of His glory. That was His original intent for everything; that’s why the Bible tells us that the earth will one day be restored, and will be full of His GLORY as the waters cover the sea. We were always intended to be filled with the glory of God; to inhabit His world in the third Heaven, and for His Spirit to inhabit us. But Adam and Eve fell, and the world was corrupted by sin. Ever since that time, God has been in the restoration business. God is obsessed with redemption. He forgives our sins, and restores us to eternal life when we receive His salvation in Christ Jesus. He heals our sicknesses and diseases, restoring our bodies to divine health. He restores our finances to a state of heavenly abundance when we tithe and give generously, even if we start at rock-bottom. He redeems our minds from depression and fear, restoring us to a state of power, love, and a sound mind instead. He delivers us from sin, and restores us to His original intent for us to walk before Him in holiness and purity. and to demonstrate His fullness and abundance on the earth. So when I hear someone talking about restoring this person or that person, I say: BRING IT ON! As the Psalmist wrote in Psalm 103:4, God has redeemed my life from the pit–so who am I to refuse to let God execute those same mercies on someone else? Who am I to hinder God’s work on the earth? 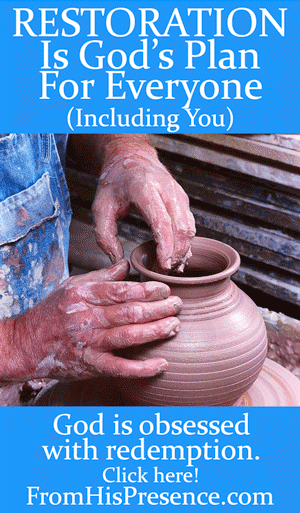 Like a Potter at His wheel, Father God is molding and shaping all of us. He is changing all of us. He disciplines and chastises all of us–because He loves us, and because of the blood Jesus shed for us. So let’s start restoring, church. Let’s be disciples of Jesus, emulating Him in every area, rather than just fans of Jesus. Let’s be carriers of His heart on the earth. God is obsessed with redemption. His entire work of grace in your life and mine is all for the purpose of restoring us to His original intent. Will you be both a receiver and a conveyer of His restoration today? Mmmmm… great point. How often do we think of it until our state of “falling short of His glory” becomes public? That brings to mind a good prayer: Lord, restore me to walking in Your glory. Thank you so much for reading, Katie!